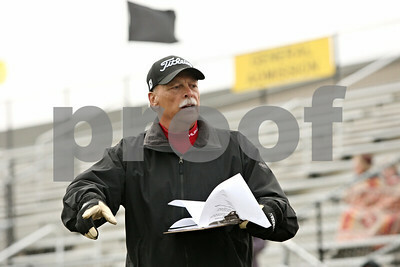 Rob Winner – rwinner@shawmedia.com Brad Roberts helps check in runners during the Gib Seegers Track and Field Classic Friday, April 27, 2012, in Sycamore. 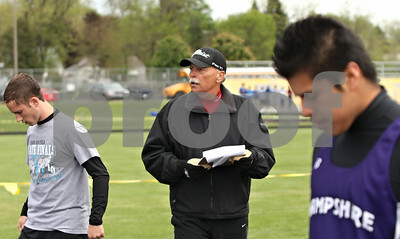 Roberts volunteers at numerous track and wrestling events at Sycamore High School. Rob Winner – rwinner@shawmedia.com Northern Illinois University Cares Day volunteers including Jackie Owensby (from left), Lauren Robak, Kayla Shick and Randy Bergman help clean up Dave Miner's (second from right) front yard Saturday, April 14, in DeKalb. Miner injured his shoulder five years ago and appreciated the volunteers' help. 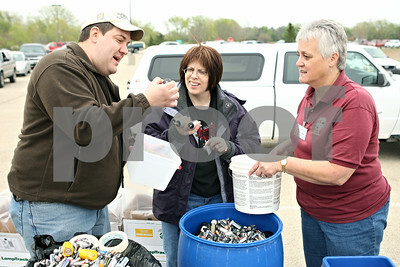 Rob Winner – rwinner@shawmedia.com (From left to right) Greg Maurice, Chris Bagby, and Christel Springmire sort batteries dropped off during a DeKalb electronics recycling event Saturday, April 14. 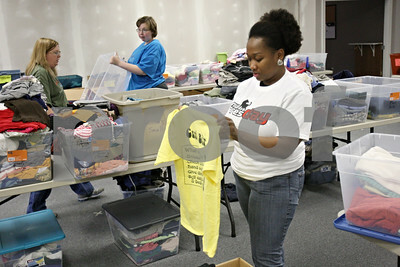 Rob Winner – rwinner@shawmedia.com Northern Illinois University graduate student Joy Mitchell (right) helps sort clothing while volunteering for NIU Cares Day at Feed'em Soup in DeKalb Saturday, April 14. Rob Winner – rwinner@shawmedia.com Volunteer Tessa Strack, of the Sycamore High School Key Club, helps out during an electronics recycling collection at the DeKalb County Health Department's parking lot Saturday, April 14. The event was sponsored by the DeKalb County Solid Waste Management Program and the DeKalb County Farm Bureau. Kyle Bursaw – kbursaw@shawmedia.com Don (left) and Dee Anderson, seen in their Sycamore driveway, deliver for Meals on Wheels every Tuesday and sometimes fill in other days as substitute drivers. 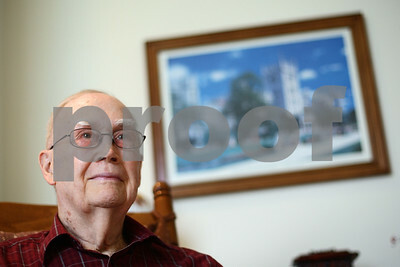 Photographed on Wednesday, April 25, 2012. Kyle Bursaw – kbursaw@shawmedia.com Pat Bute chats with patient Burly Billips while pushing him to his destination in Kishwaukee Community Hospital on Wednesday, May 9, 2012. 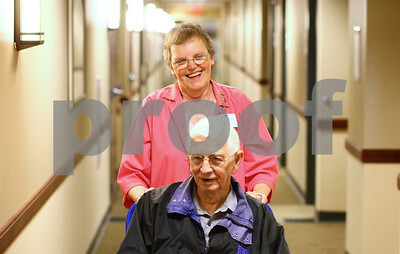 Bute has been volunteering at the hospital for about a year and half. 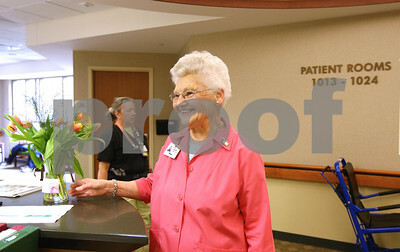 Kyle Bursaw – kbursaw@shawmedia.com Kishwaukee Community Hospital volunteer Mina Johnson brings flowers from the front desk to one of the desks within the hospital on Wednesday, May 9, 2012. Johnson has been volunteering at the hospital for 15 years. Kyle Bursaw – kbursaw@shawmedia.com Paul Johnson, pictured here in his Sycamore home, is a longtime board member and volunteer with Hope Haven and will be leaving the board at the end of June. 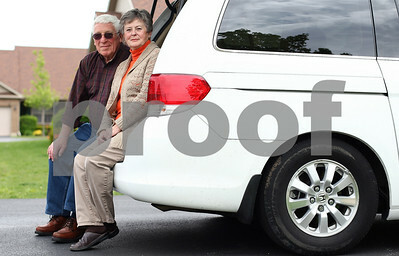 photographed on Wednesday, April 25, 2012. 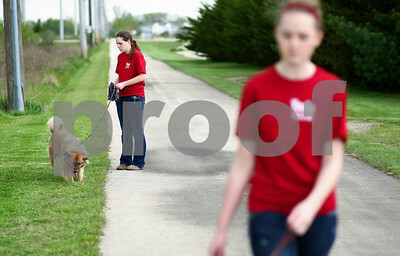 Kyle Bursaw – kbursaw@shawmedia.com Deanne Winterton, 18, prepares to clean up after a dog while she and classmate Megan Drendel (foreground) walk dogs while volunteering at TAILS on Wednesday, April 18, 2012. Kyle Bursaw – kbursaw@shawmedia.com Robin Waffle plays a counseling board game called "The Talking, Feeling, Doing Game" in a session with Dakota Klotz, 11, and his mother Heather Klotz (not pictured) at the DeKalb Youth Services Bureau on Thursday, May 10, 2012. Kyle Bursaw – kbursaw@shawmedia.com Robin Waffle (left) shares a laugh while plays a counseling board game called "The Talking, Feeling, Doing Game" in a session with Dakota Klotz, 11, (right) and his mother Heather Klotz (center) at the DeKalb Youth Services Bureau on Thursday, May 10, 2012. 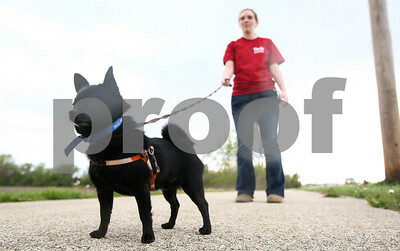 Kyle Bursaw – kbursaw@shawmedia.com Volunteer Quinton Leitsch, 16, walks Sugar outside TAILS in DeKalb, Ill. on Wednesday, April 18, 2012. Kyle Bursaw – kbursaw@shawmedia.com Deanne Winterton, 18, waits for classmate Megan Drendel to catch up while the two volunteer at TAILS walking dogs on Wednesday, April 18, 2012.